What a great recipe you have given us! Lots of good information as well. Ladyfingers were at King Soopers near where the strawberries were displayed. You can google them and make your own from recipes o line - such as Julia Child's recipe.Thanks for linking to Friends Sharing Tea. I love Biscotti - and perhaps will try your recipe next!! Happy Tea Day! Your new book looks like it would be very interesting! Love your teacup, so pretty. Your dessert looks yummy, thanks for sharing the recipe! Happy tea day to you! Your book is wonderful and I would love to take a peek through it. Your hubby did well to choose that pretty teacup for you and the spoon from your mother is lovely. Thank you for joining me for tea, my friend. Have a happy week. Your cup is very pretty! It has my favorite handle and shape. Your husband did well. One book I looked in had a back stamp almost exactly the same as the one you show (missing the Reg. ), and put the date between 1939-1949. I have never tried making biscotti, but have always wanted to give it a go. Thank you for sharing about it. Yours looks very good. What a sweet husband you have, he knows what you like and I love that you show appreciation for him. The teacup is lovely, and tea and biscotti are made for each other. Do your children help you bake? what a pretty, dainty cup and saucer! Love how you displayed the biscotti in a vase! All you good cooks are killing me with all your great food. I would enjoy having a visit and enjoy one of your treats. Thanks for the recipe. 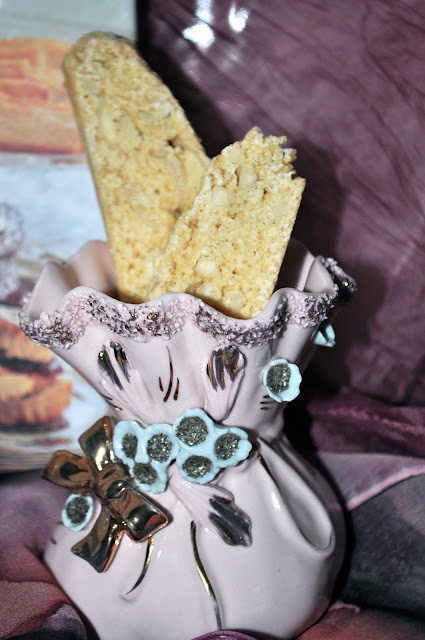 I love biscotti, especially with almonds! Your china is lovely. That does look like a nice book, and thank you for sharing the recipe! Well YUM! That looks like a delightful book and with the end results being such delicious items, it's the gift that keeps on giving! And all your sweet gifts are so sweet. It is always so fun to think back of the loved one who gifts us with certain items. Lovely post! Thank you so much for sharing your pretties with us for my party! I love the site. The photo of your family is beautiful. Just dropping in from How Sweet the Sound for Pink Saturday! Be blessed! 'what a nice surprise for your birthday. Love your tea pot. I love tea and Biscotti. I love the way you arranged the photo with the biscotti, tea and book. Very nice! How sweet that your hubby knows you so well he could (and would) enter an antique store (gasp!) and pick out such a gorgeous confection! I will have to try the recipe, what a good friend. Thanks for sharing with us. Visiting from "Inspire me Monday" @ Create with Joy, I think your blog is so cute! Your recipe for Biscotti looks great! and..your pictures are just lovely! Im your newest Linky and GFC follower. 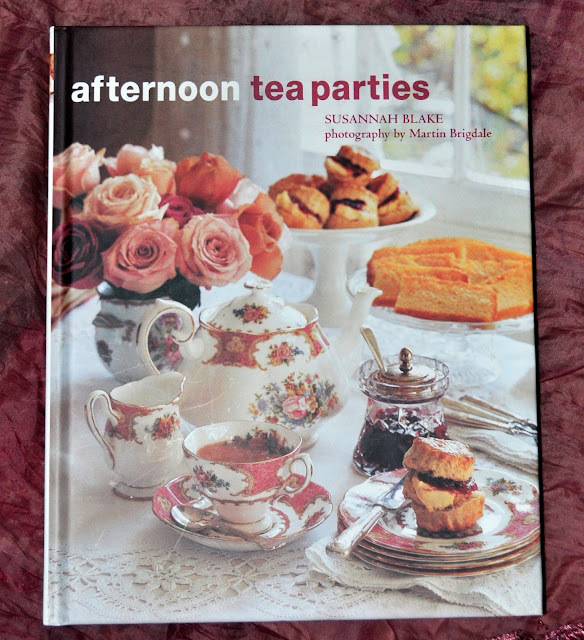 What a lovely addition to a tea party! I have always loved biscoti, but would have to figure out a gluten free way to do it. Hope you can stop by the enchanted oven to say hi. Sarah, this sounds so yummy and I adore your sweet tea set. Hubby did good! Thanks for sharing with SYC. A very pretty tea! And I love the book! Sorry I am so late in visiting from last week's party. It has been a hectic week. thank you for joining the party! Your book looks wonderful. What a great item for your collection!